Learning the names of ballroom dance steps can broaden your dancing horizons or just make you a more informed viewer of dance-related television programming. The steps listed below are just a sample of the countless possible dance movements in the world of ballroom dancing. Some are purely descriptive, while others evoke an image or are steeped in dance history. Some names appear again and again, such as the promenade, as each tradition offers its own take on an essential dance step. Slight variations may also exist in the naming of steps depending on the origin of the dancers and their competitive affiliations. If you're interested in learning more about these steps, free ballroom dance instruction videos and other online resources can get you started. For instance, The Dance Store's Online Learning Center includes instructional videos for more than 20 dances, many of them ballroom. You can review these lessons as many times as necessary and pause at key moments so you can imitate the steps flawlessly. Of course, one of the best ways to learn more about this form of dance is by taking a class. The franchised locations of Fred Astaire Dance Studios specialize in ballroom dancing instruction. Check your phone book for local studios. Some community enrichment or parks and recreation departments also offer short-term ballroom dance classes. If you're interested in competitive dancing, USA Dance, the United States organization overseeing DanceSport competitive ballroom dancing, offers a syllabus of recognized steps. 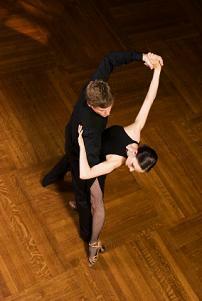 The names of ballroom dance steps are divided according to proficiency level. The BallroomDancers.com glossary is helpful for looking up unfamiliar step names and dance terms. If you enjoy watching ballroom dance, the PBS program America's Ballroom Challenge brings the fun to your television. After each episode airs, a summary of the program's dances appears online, including information on the competing couples and a list of the songs featured during their dances. The site's resources page includes links to ballroom dance organizations, dance studios, and competitive groups. Elements of Dance Etiquette offers a wealth of information for dancers considering stepping out for the first time. Learn more about ballroom etiquette, discover how to get off to a smooth start in any dance, and find out techniques for dancing your way out of tricky situations.